GABA is gamma-aminobutyric acid, one of the neurotransmitters in the human brain that serves as the mind’s natural calming signal. It is a neurotransmitter that helps relieve anxiety, improve the quality of sleep, relax and even prevent seizures. By attaching to the protein in your brain, or GABA receptor, it produces a calming effect, therefore, reducing the feeling of stress, anxiety, and fear. It reduces overactivity in your brain and brings up emotional intelligence, cognition, and attention. It can even increase your energy level and enhance the exercise performance. There are a lot of benefits to GABA and we have listed 5 proven health benefits of GABA below. Through a series of various studies that included different patients, it has been proven that people who suffer from insomnia or experience poor sleep have a lower level of GABA. In various studies, it was discovered that the patients either had lower GABA in their brain or in specific regions of their brain which influenced the quality of sleep. GABA has a sedative effect that helps naturally influence sleep by reducing the nerve excitation. Using the supplements that promote GABA activity, maintaining the schedule of your sleep, limiting the amount of intaken caffeine and taking magnesium to enhance the function of GABA can help you significantly improve your sleep. Reduction of the nerve excitation is one of the main functions of GABA directly connected with the feeling of anxiety and fear. GABA provides a calming effect, and the decreased level of GABA is often said to be a reason for anxiety disorders. There are a few natural ways to increase GABA function and lower the anxiety. For example, meditation, essential oils or sedative herbs, such as valerian that helps increase GABA levels. Additionally to anxiety and sleep issues, low levels of GABA can also contribute to depression. The studies show that people suffering from depression have lower GABA levels, which increased after the depression was treated. With its antidepressive effect, GABA can be a good alternative to the traditional depression treatment. Besides, there are ways to help the process and improve GABA level by balancing your diet and exercises and keeping up with your vitamin D requirements. PMS, premenstrual syndrome, involves various symptoms that include mood swings and exhaustion that happen in women between ovulation and the start of the menstrual period. According to the studies, during this time the GABA level is off and can lower during the cycle. GABA can help improve the symptoms of PMS and even act as a natural pain reliever as it can be involved in the mechanism of menstrual cramps. Together with other supplements, such as vitamin B6, it can help balance the hormones improving the symptoms. HGH is a human growth hormone that promotes muscle growth, bone strength, lower risk of heart disease and the lack of it can cause serious problems in the human body. For example, delayed puberty, depression, sexual dysfunction, insulin resistance, etc. Studies prove that GABA can help improve the level of HGH. A study that involved 11 men, who were either taking GABA supplementation or placebo followed by training or rest, showed that the HGH level of the participants raised to 400 percent. GABA can be beneficial in many ways for our health and taking GABA supplements can significantly improve the quality of your life. However, remember that it’s always recommended to consult with a professional if you are considering such aid. 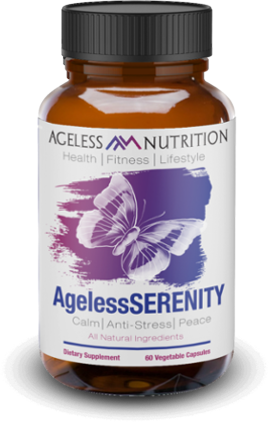 You can find GABA in a couple of our premium, all-natural supplements such as AgelessSERENITY and AgelessSLEEP. These supplements assist with stress relief, sleep support, anti-anxiety, and more. GABA plays an important role in our expert formulas that are manufactured in the USA.